Walter Klemperer's historic 1964 recording of Mozart's Die Zauberfl?te is a genius in operatic productions. Unlike Le Nozze di Figaro or Don Giovanni, Mozart's final opera is so dramatically convoluted and ridiculous that the recitatives provide more of a source of distraction and confusion than storyline continuation. Thus, Klemperer sculpts a marvelous collection of arias and ensembles with arguably the finest Mozartian cast ever assembled. The Philharmonia Orchestra is, for the greater part, in excellent form. Only occasionally does it sound archaic under Klemperer's traditional direction. The latter is also a bit sluggish at times, but, then again, Klemperer is often praised as a "slow conductor." The Overture is a beacon on his brilliance in lovingly drawing out the music into an almost panoramic phrase of majestic delight. Conversely, the eminent Act II duet "Pa-pa-ge-no! / Pa-pa-ge-na!" is taken horridly slowly and loses much of its energetic vitality. The soloists - particularly the women - are where the true brilliance lies, nonetheless. Lucia Popp provides a career performance as the K?nigin der Nacht and fully defines the character described as a "vulture with the voice of a nightingale." Her renditions of "O zitt're nicht, mein lieber Sohn!" and "Der H?lle Rache kocht in meinem Herzen" are utterly breathtaking. Hearing sublime, creamy-voiced Gundula Janowitz as Pamina is an absolute joy. Her demure duet with Berry ("Bei M?nnern, welche Liebe f��hlen") is one of the most beautiful moments on the entire recording and her despondent aria ("Ach, ich f��hl's, es ist verschwunden!") is truly heartrending. Elisabeth Schwarzkopf, Christa Ludwig, and Marga H?ffgen (the superlative Erda in Solti's 1963 Siegfried) - in the dictionary definition of unmatched choice casting - are a fiendishly celestial trio as the three ladies in the service of the K?nigin der Nacht. They are a particular delight in the lusty Act I quartet "Stirb, Ungeheuer, durch uns're Macht!" with Gedda. Agnes Giebel, Anna Reynolds, and Josephine Veasey are another great trio as the three boys in the service of Sarastro, especially in their pleasant trio "Seid uns zum zweiten Mal willkommen." There have been greater Papagenas than Ruth-Margaret P��tz, singularly Renate Holm (for Solti), but the former is certainly competent in the small role. Nicolai Gedda can only be seconded as Tamino by the illustrious Fritz Wunderlich. His voice - virile, gallant, daring - gives the very "un-laudable" character of Tamino the chivalrous, convincing sound he requires. His wondrous arias "Dies Bildnis ist bezaubernd sch?n" and "Wie stark ist nicht dein Zauberton" are excellent examples of the master Swedish tenor's lyric genius. Walter Berry is certainly the most likeable Papageno on record, especially during his two great arias ("Der Vogelf?nger bin ich ja" and "Ein M?dchen oder Weibchen") and quintets ("Hm! Hm! Hm! Hm!" and "Wie? Wie? Wie?" ... "Ganz nah ist euch die K?nigin") with Gedda, Schwarzkopf, Ludwig, and H?ffgen. Gerhard Unger fails to project a Monostatos as nasty as Gerhard Stolze, but he is no less cruel and vindictive. His sniveling aria ("Alles f��hlt der Liebe Freuden") is a definite highlight. Oddly enough, it is Gottlob Frick, one of the greatest Wagnerian basses in operatic history, who nearly sinks the boat. He sounds unsettlingly wobbly and antiquated during Sarastro's great arias ("O Isis und Osiris" and "In diesen heil'gen Hallen") but most unforgivably so during his first few moments on stage ("Steh auf, erheit're dich, o Liebe") and during the trio "Sol lich dich, Teurer" with Janowitz and Gedda. Franz Crass is imposing as the old Sprecher in his long duet with Gedda ("Wo willst du k��hner Fremdling hin?"). He and Karl Liebl are sanctimonious as the two armed men in the Act II hymn "Der, welcher wandelt diese Stra?e voll Beschwerden"; he is also excellent with Unger as the two priests in the similar Act II duet "Bewahret euch von Weibert��cken." This is recording contains out-of-this-world performances by all the cast, but I know that the greatest measurement used in assessing recordings is "does it contain a good Queen of the Night?" And the answer that I give is: Lucia Popp was made by God spefically to sing the role. But first, let's go through some general points. Otto Klemperer's recording of The Magic Flute is an achievement unparalleled in the history of the grammophone. The only minor drawback is that there are no dialogues (Klemperer was adament not to include them for personal and mysterious reasons)...so it's pure music from start to finish. This isn't just another "nice" Mozart opera, it has a special significance and is esoterically important for everyone to understand symbolically. What's interesting to notice is how it begins as a comedy and ends up being serious. Mozart was a free-mason and along with Haydn knew "the mysteries" and revealed them in story/musical format. Mozart's Magic Flute is based on an ancient Egyptian initiation and deals with the four ordeals. If you want to learn more about these "mysteries" etc. I recommend investigating the texts and books of Samael Aun Weor and Rudolph Steiner. This isn't much I can add regarding the indiv��dual performances on this set, as most are great. However, Popp is a great misfire in the role. She hits all the notes, but can she sing any slower and with any less excitement? It is all Klemperer's fault...the man has no idea how to conduct Mozart. All the excitement has been completely sucked out of Die Zauberflote through his lackluster conducting. It is a known fact that Mozart himself preferred faster tempos and Klemperer's conducting drags, and frankly it is a dreadful bore. Solti's first recording with the Vienna Philharmonic (now out of print), Boehm's great recording, and even Solti's with Sumi Jo and Marriner's recordings are superior to this set. I have to confess that of the major Mozart Operas, I don't care as much for Zauberflote as I do for the Da Ponte trilogy. In Klemperer's version, all of these elements are incredible - especially Lucia Popp's Queen of the Night (for me, a weak performance of her character can simply ruin the whole thing). When Popp "hits the high F's", the effect is purely supernatural - sometimes I can't help wondering if her arias were recorded by someone other than a human being! As for Sarastro, I believe George Bernard Shaw said that the arias Mozart assigned to the high priest would "not sound out of place in the mouth of God". Indeed, one can understand what Shaw meant, when listening to them here. Quite a cast-list, wouldn't you say? The eminence of the performers is no guarantee that you will like their approach of course, but this is very much my own idea of how to perform the Magic Flute, at least of how to perform it in sound alone. Leaving the singing aside for a moment, I commend Klemperer wholeheartedly for missing out the spoken dialogue on record, although I would want it retained in the opera house or on DVD. The Magic Flute is a pantomime, for all the solemnity and significance of the masonic elements. The plot, such as it is, is the least important thing about the work. It is neither coherent nor consistent, and that fact is neither here nor there. Pantomimes, some lightweight plays and sketches are often not concerned with consistency or coherency but just let the situations develop more or less at random or simply as they come into the writer's head. The sense of freedom from tighter discipline is what gives them a lot of their special attractiveness. Add Mozart's music to this and the result is something very special. Mozart was a born dramatist, but he surely must have enjoyed the sense of release from normal dramatic constraints as much as normal human beings do. Taking the plot for what it is, a string of loosely connected situations, he set his imagination free on each of them in turn. In sound alone that's all I want to hear - Mozart's incredible music. Consistency and coherency are things of the intellect. Music is partly that too, but not mainly. It draws on something deeper than rationality, and it is the sense of irrational liberation that makes the Magic Flute, for me, the most astounding thing that even Mozart ever did. Klemperer would not have been the first conductor to come to my mind in connexion with the Magic Flute. As you would expect, he is not the speediest, but he doesn't dawdle either. The Magic Flute for me is less a drama than a musical tableau, and it's the purely musical rather than the dramatic aspects that interest me in it. With a cast like this we would expect outstanding musicianship and accomplishment, and in general we would be right about that. A great deal is a matter of personal opinion and personal taste, more so than usually. The three Ladies are no less than Schwarzkopf, Ludwig and Hoeffgen, for instance. That's an astounding trio, but they don't quite astound me somehow, splendid though they are. Gedda's voice is one that I particularly like, so I don't fault his Tamino. Ruth-Margret Puetz is just fine as Papagena and Walter Berry strikes me as an outstanding Papageno. The divine Gundula Janowitz is divine as ever in the part of Pamina. However the `high spot', in a rather vulgar sense, of the Magic Flute is the successive arias for first the Queen of the Night and then for Sarastro in Act II. Here we have slightly mixed success. Lucia Popp is, for me, simply superlative. I have heard that extraordinary thing done faster and more `dramatically' but never with greater technical assurance, and as I've probably made clear by now it's not a more dramatic reading that I'm after. Klemperer's steady tempo here is as I like it, but it suits Frick less well. He has the right resonance in his low notes, but the slowish tempo does not do his steadiness or quality of tone any favours. Franz Crass was on hand for a couple of smaller roles, and I wonder whether he might not have been a little better as Sarastro. This aria was described by Shaw the only music that might have come from the mouth of God, and I've heard it attain more nearly to that status than it does here. 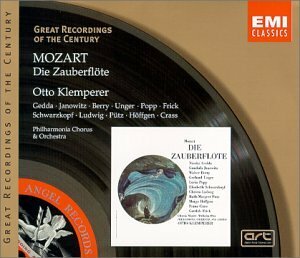 After listening to several recordings of Mozarts "Die Zauberfl?te" I think that the recording with Klemperer is THE RECORDING. It is distinguished by an absolutely excellent cast of singers, to mention a few the charming and natural Walter Berry as Papageno, the beautifully and lyrically singing Gundula Janowitz as Pamina, the unstrained Lucia Popp as Queen of the Night. And you could mention several more star-singers. Only Gottloeb Frick as Sarastro might in certain parts seem in certain passages a bit unsteady in his singing, but his voice is beautiful. The technical quality of the recording is fine. The voices stand out with personality, the instruments with intensity. You feel close to the music; you feel captured by the "Stimmung". Artistically, the Klemperer interpretation is natural, convincing, contemplative. When switching to and from this recording and others I consistently experienced that my body relaxed when the Klemperer Flute was put on. After listening to several other recordings by B?hm, Solti, Sawallish, Gardiner etc. I must say, that I can strongly recommend the Klemperer edition. One should be aware that no speech is on this recording, only pure music. Although the Klemperer recording is not the "Magic Flute" I grew up with (that would be the Karl Bohm on DG)it has, in recent years and after many hearings, certainly become my favorite. Despite a few who might think otherwise, this is a recording that has been (almost) universally praised and loved and with very good reason. There are certainly a plethora of praiseworthy reviews of this recording available on this site, and there's probably very little to add here, except for the fact that I can find very little, if any, fault with this recording, despite its lack of dialogue. It was this very reason why I chose the Bohm over the Klemperer as a youth, and I don't regret it. I agree that the dialogue is essential to understanding this opera (Schikaneder's libretto is much maligned in my opinion; it has been derided by everyone from early critics to Peter Schaffer's Kostanze Mozart in the film of his famous play)and for this reason I wouldn't recommend this recording be the ONLY one on the shelf of anyone wanting to study the work in depth. But in the long run I think the main thing we should be concerned with is the musical performance: this is a recording, after all, not a stage performance (operetta and broadway recordings ommit the dialogue routinely) and this one is virtually perfect. From the opening triadic passage to the final moment Klemperer is supremely in charge, and his love for this music shows in every detail. And the voices! Almost every part is superbly cast: Gedda's Tamino is (in my opinion) the best on record; Janowitz' voice is in full bloom and she radiated Mozartian delicacy as Pamina; Berry is full-voiced, jocular and, most importantly, likeable as Papageno; as has already stated, Lucia Popp owned the role of the Queen of the Night and this is, by far, her best recording of it (surpassing the one she did later with Haitink); and the list goes on and on. And who could argue with the extra bonuses of Schwarzkopf and Ludwig as two of the three ladies, and the marvelous Speaker of the rich-toned Franz Crass? When all the points of the compass meet in such a superb way, and under such a masterful hand, who could find fault? If you want the dialogue, then by all means pick up the Bohm (although I have some reservations about Evelyn Lear's Pamina)or the (unfortunately out-of-print) Levine on RCA, which was the first recording (to my knowledge) to include the dialogue completely uncut. But if the music is your primary concern, you can't go wrong with Klemperer. The best? I DON'T THINK SO! 1) What in tarnation was Klemperer thinking when he omitted the dialogue????????? Ok, so the dialogue isn't the best in the world, is corny at times, and fine, it's "banal". But one important thing: it's CRUCIAL to the drama, and pray remember that opera is DRAMA set to music. When you omit the dialogue, you don't have a recording of an opera. You have an extensive (not to mention expensive) set of highlights. What I really love to do is listen to a complete opera recording on my HiFi stereo while plopped and relaxed on my couch, with libretto in hand. I allow my imagination to provide the sets and staging, and then allow myself to enter the wonderful world of opera as drama. This Magic Flute recording however, makes me tear out my hair in frustration. All dialogue is missing so there's absolutely no "action" between the music. Yes there's a "summary" of the missing dialogue, but they're oversimplified. Hence ALL the humorous overtones of what some of the characters say to each other are lost. The little bits of funnies, and the little details are, in my opinion, too important to be dismissed, being labeled as "banal". It just annoys me that the driving force of the plot contained in the dialogue are gone, and aria follows another aria/duet/chorus/etc (and if you brush up on definition of opera terms, you'll see that it's the recitative or dialogue that propels the story, and arias and choruses are the reaction to the action-expressing emotions and feelings. Hence removing the dialogue is unacceptable to me). 2) I agree that Gundula Janowitz has the perfect voice for the role of Pamina. However, I feel she is way overrated. Yes the role calls for lyrical and gentle singing, which reflects the character. However I don't sense any characterization to her singing at all. I don't feel the angst in her voice when she sings "Ach ich fuhl" nor the joy when she first sees her Tamino, her rescuer. Because we couldn't see the singers physically, it's all the more important that they use vocal acting to convey the character's emotions. Janowitz's singing sounds the same no matter what emotion she's trying to express. 3) Lucia Popp is the saving grace of this recording, and she gives a performance worthy of a B+. However, after hearing Beverly Sills' and Edita Gruberova's renditions of Der Holle Rache (two that I believe are 100% perfect; furiously sung, and sung virtuosically FAST, like it's SUPPOSED to be! ), Popp's pale by comparison, despite how good it is. Yes she hits all the high notes, but the F's are thinner than I prefer. The notes a bit lower than those F's are absolutely beautiful however, so that's really not too bad a thing. What I didn't like was how SLOW this "vengeance aria" was sung! C'mon Lucia, you're supposed to be hopping mad, not skipping in a bed of daisies! This is why I never acknowledged Popp as a coloratura in the first place. She has the high notes, but she doesn't have the agility to compare with the likes of Sutherland and Sills (especially Sills). It really is unfortunate that Klemperer was chosen to conduct or else this would've been a much better recording. Many good things can be said of certain singers' performances, but the above mentioned flaws pull this recording down, big-time. There may not be a "definitive" Magic Flute on record, but this version comes pretty close, even if the spoken dialogue is omitted (not something that bothers me greatly-besides, the dialogue sections are summarized in the booklet). This recording has always been famous for the contributions of the two women principals-both were young at the time, and both became internationally famous after the set was released. Lucia Popp's Queen of the Night could hardly be bettered; in addition to singing the role flawlessly, she is practically the only Queen on disc with a truly malevolent aura. With Klemperer's help, she makes the vengeance aria not just exciting, but also powerful. Even better than this, perhaps, is Gundula Janowitz's Pamina-the most accurately and beautifully sung on any complete recording. This performance is a perfect demonstration of just how powerful vocalism can be by itself-that is, removed from "dramatic commitment." Actually, I think Janowitz is more dramatic than many have given her credit for-her voice has a wonderfully desolate, empty sound in her great aria-but there's no question that this is a "prima la musica" interpretation. In addition to these two singers, the set's greatest asset is Klemperer, who gives a strikingly individual reading of the score: he gives the score a symphonic weight and majesty, but his slow tempi work just as beautifully for the lighter passages. Among the other singers, Walter Berry makes a rich-toned, lively Papageno, but the other two men are less than ideal. Surprisingly, Nicolai Gedda's singing here lacks beauty-his Pamina sings him right off the stage. Gottlob Frick, as Sarastro, sounds tentative and, at times, lacks firmness. Smaller roles are reasonably well taken: Gerhard Unger sings Monostatos well (though he sounds as if he couldn't hurt a fly), Franz Crass is a firm-toned Speaker, Ruth-Margaret Putz a pleasant (if thin-toned) Papagena. Much has been made of the "deluxe" casting of Elisabeth Schwarzkopf, Christa Ludwig, and Marga Hoffgen as the Three Ladies; I'm inclined to think that all three of them sound desperate to capture the spotlight. How does this measure up to other Flutes? Well, Karl Bohm's 1964 version has at least two glorious performances-Fritz Wunderlich's Tamino and Dietrich Fischer-Dieskau's Papageno-but the women sound almost amateurish next to them. Karajan's 1950 version is indispensable for Irmgard Seefried's stunning Pamina, even if it doesn't have much else of spectacular interest. The famous Beecham recording from the 30s still has its admirers, thanks chiefly to Gerhard Husch's brilliant Papageno and Tiana Lemnitz's shimmering Pamina (though I wouldn't necessarily trade the latter for Seefried or Janowitz). All these performances have their merits, but this Klemperer version is the most consistent overall. One of the first innovations Mozart imposes onto the opera genre is the use of small dialogs between the arias to set up some dramatic elements in a light way, very easy to understand and integrate. That gives lightness and speed to the opera. We can't but think of the pantomime genre the English likes so much. Mozart plunges his imagination in old Egyptian beliefs and myths, Isi and Osiris first of all, of course. But he also refers to Selene the Goddess of the night and the moon, and her three Ladies representing the triple Goddess of old who will be defeated in the end in her triple femininity trying to dominate the world. We cannot but think of the reverse use of the triple Goddess, in a christianised form, by Goethe in his Second Faust when he decides to redeem Faust and save him from damnation. Mozart is constantly speaking of love and love affairs that are crossing, entertwining in all possible knots. That should lead to tragedy and many deaths. But Mozart is a believer in peace and peaceful solutions. So he leads his strifing lovers and his ambitious kings and queens to realizing that freedom of choice is the only solution and it has to be accepted by all. The social vision Mozart carries in him is very consensual even if it is for total freedom and change. And the music dances in our ears like the stuttering of Papageno when uttering his name. Mozart associates all extremes together and remembers that his two priests are the reincarnation of Boaz and Jachin, the two pillars, the two masters, the two figures that loom behind Solomon's Temple, the background of Mozart's freemason friends. He thus defeats the Queen of the Night with nothing but notes on the lines of his score. Boaz is the stable basis and Jachin invents all kinds of innovations that destabilize the poor Queen and the establishment without crashing them to the ground, just making them step back and accept the freedom of these sorcerer's apprentices, this Papageno that can charm and tame all birds, or this Pamina that only wants love both for herself and for her tyrannical mother, or the deep voice of Sarastro that makes our souls shudder with pleasure and fear, exhilaration and awe. The Finest of Mozart Interpretation in this Piece! For many years I have played this recording over and over and can simply say this is one of the best sung and performed Flute's about...the pacing and flow are natural and in spite of the dialogue being cut(none of it makes any sense anyway) we have a miracle unfolding before our very ears. Klemperer has always been a conductor to arouse controversy...he was a champion of Stravinsky and Hindemith to name a few and really could perform music in such a way that it became clear. As to the ensemble work the Philharmonia has a perfect quality of lightness of tone which I daresay adds a special quality to this work. There is no American performance of this work that comes near to the exceptional work of Cast and Orchestra. I doubt today you could come close to finding a performance even near this one, excepting the Solti Vienna version from the mid 80s. This recording of Mozart's masterpiece is handicapped from the start by the fact that it omits the spoken dialogue, essential to the plot. I have never understood why, before the 1950's-1960's, no one recorded the dialogue: not Beecham, not Karajan, not Klemperer. It is a serious drawback. However, this recording scores in other departments. Klemperer's direction is firm, rock-solid, monumental in the dramatic moments, but surprisingly charming for Papageno and company. The Philharmonia forces, as always, play and sing like gods ("Sterbliche den G?ttern gleich" indeed! ), unsurpassed on disc. The cast, however, is slightly more problematic. Nicolai Gedda is not as lyrically effortless a Tamino as I hoped or expected from him; he pales when set beside Wunderlich for B?hm (DG). Gottlob Frick, generally a very reliable singer, is in shaky voice here as Sarastro, uncomfortable with Klemperer's slow tempos for his two glorious arias. The Three Ladies are enormously famous (Schwarzkopf, Ludwig, H?ffgen), but sound middle-aged and do not blend well; Schwarzkopf in particular is atrocious (dry tone, unbearably coy, overdone, exaggerated). The Three Boys, as in so many recordings, are not boys but women, who cannot reproduce the unique, flutier sound of boy trebles that Mozart understandably wanted here. Franz Crass, Sarastro for B?hm, here sings the Speaker, the Second Armed Man, and the Second Priest with dark, firm tone but no expression. Karl Liebl is a third-rate First Armed Man, no match for James King for B?hm; Gerhard Unger is a boyish, unsinister Monastatos. HOWEVER!!! This recording MUST be heard for the singing of Walter Berry (Papageno), Lucia Popp (Queen of the Night), and Gundula Janowitz (Pamina). Berry sings with a resonant, dark baritone, a great, sparkling sense of humor and crystal clear diction. Lucia Popp is a singularly astounding Queen of the Night, with full, silvery, juicy tone throughout her enormous range. She tosses off the coloratura effortlessly and still manages to characterize! Unbelievable. But the crowning glory of this set is Janowitz as Pamina. Her large, silvery, radiant voice is ideal for her role, and while she is not as involved as she could be, she must be counted the greatest Pamina on disc. She, too, must be heard to be believed. Klemperer or Bohm in the Mgic Flute? The recent appearance of an excellent Magic Flute from Abbado (DG) prompted me to go back to two great favorites, this Klemperer set from 1964 and one from Karl Bohm made the same year for DG. Between them they included probably the greatest Mozart singers of the time in Europe. As listeners could hear immediately, the strengths of one cast were offset by the strengths of the other. Klemperer had the best women (Janowitz, Popp, Schwarzkopf, Ludwig) while Bohm had the two best men (Wunderlich and Fischer-Dieskau). For foty years fans of the opera have had to own both. Is that sitll the case? Klemperer: Always a good recording, the new remastering in EMI's Great Recordings of the CEntury is nearly perfect. The Three Ladies are enchanting as led by Schwarzkopf and Ludwig. The young Lucia Popp is a scintillating Queen of the Night, and Gundula Janowitz a pure, if rather cool Pamina. Also, one cannot discount Gedda's Tamino and Berry's Papageno, which are very well sung if not the best on CD. For many listeners what tilts the balance is Klemperer's magnificent conducting--he may well have been the greatest Mozart conductor of the century. What may tilt the balance the ohter way is the absence of spoken dialogue, a regrettable older practice in Mozart opera recordings. Note that because of its many reissues, this Flute can be had in its older version for around $10 on the used market, and even the new remaastering is under $20. Bohm: Where Bohm's set is strongest it can't be beat: the once-in-a-lifetime Tamino of Fritz Wunderlich and the masterful, humorous Papageno of Fischer-Dieskau. They, combined with Bohm's expert, if rather measured conducting, have won many listeners over. Unfortunately, Bohm's weaknesses are very weak indeed: a too-mature Pamina from Evelyn Lear that sounds unpleasantly insecure in tone and pitch, and a thin, shrieky Queen of the Night from Roberta Peters, well past her prime. If you can't overlook these two, there's no need even to consider Bohm. Lots of dialogue is included, and for once the echt Deutsch acting is funny. Mozart's last opera was also his best. Many would argue this, but it is The Magic Flute that incorporates all of Mozart's strengths as a musical composer for orchestra and a composer of opera. It is also an opera that most expresses Mozart's ideals and religious beliefs (he was of the Freemason Order) and is along with the Requiem his most spiritual and profound work of art. In addition, it is light-hearted, very comic and highly entertaining, even suitable for children. The Magic Flute has become a standard opera in the repertoire of opera houses worldwide, especially popular and a long-lived tradition of being performed at the Vienna Opera. This recording has one of the best cast assembled for an Opera Recording, Janowitz, Berry, Popp, etc. However although their voices are amazing you can feel that there was no chemistry and there is a lack of feeling in their performances, specially the male parts. I also dislike the tempo of the recording, sometimes it gets too slow and personally I feel that you loose the rhythm of the story. This is my second recording for this Opera, my first one is the version directed by Karl B?hm and I have to say I prefer that one, although the female voices are inferior to the ones of this recording you feel more in them. You beauty Karl et al.